If you’re like most people, you probably don’t give too much thought about the health of your teeth and gums until something goes wrong. Whether suffering from a toothache, cavity, dental abscess or broken tooth, experiencing an oral health problem can not only effect your ability to eat, drink and talk, the discomfort can also cause you to lose sleep, perform poorly at work or school and cost you valuable time and money. At Barrett Family Dental, you make it our mission to ensure that every one of our patients enjoys the healthiest possible smile for a lifetime. 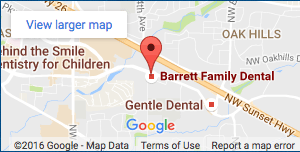 Beaverton, OR family dentist Dr. Barrett and his courteous and professional staff understands that every patient’s oral health needs are different. That’s why we treat every patient as an individual, so we can provide the exact care they need. Of course, enjoying strong teeth and healthy gums does take some work on the patient’s part at home. Fortunately, it doesn’t take much time to take care of your daily oral hygiene needs. And the time you do spend is well worth the effort. To help you enjoy the best oral health possible, here are the three steps every patient needs to take to enjoy a great looking smile. As a kid, you’re mother may have told you that sugar rots your teeth, but the answer isn’t quite that simple. Plaque – a stick biofilm composed of lingering food particles and bacteria – builds up on your teeth and along the gum line. Plaque feeds off the sugars we eat to produce harmful substances that slowly erodes away the strong outer coating of our teeth called enamel. Once plaque has created cracks your teeth’s enamel, harmful bacteria begins to pool into these crevices where it eats away at the structure of the tooth, eventually resulting in the development of a cavity. Brushing helps remove plaque from your teeth before it can cause any permanent damage to occur. Since plaque builds up on your teeth during the night and throughout the day, it’s important that you brush once in the morning and again in the evening to provide your teeth with the protection they need. The American Dental Association recommends brushing for at least two minutes each time you brush. Despite this recommendation, however, studies have shown that the average adult only spending 30 seconds brushing, or one-minute total a day. Considering the vital role brushing plays in maintaining your oral health, failing to brush long enough or thoroughly enough can have serious consequences over the long-term. If you have any questions about how long to brush or the correct to brush, make sure to ask Dr. Barrett during your next appointment. To some oral health experts, flossing actually plays a more important role in protecting the health of a patient’s teeth and gums than brushing. Flossing is held in such high regard because it allows you to clean areas of the mouth your toothbrush cannot reach – such as between your teeth and along the gum line. Harmful bacteria build up along theses areas of the mouth to cause serious damage to the health of your teeth and gums. If you don’t think flossing can make that big a difference, consider that the number one place for cavities to develop in the mouth is between teeth, and that patients who don’t floss have a higher risk of suffering from gum disease when compared to those who do. Unfortunately, despite the importance of flossing, studies have shown that only 52 percent of adults floss daily, and 10 percent don’t floss at all. If you routinely make excuses why not to floss – you don’t have time or don’t know how – consider the difference just taking a few minutes of your day can make towards enjoying a lifetime of healthy teeth and gums. Scheduling regular dental checkups and cleanings at Barrett Family Dental also plays a vital role in helping you maintain your oral health. Checkups provide Dr. Barrett with an opportunity to examine your teeth and gums for any signs of decay, gum disease or oral cancer. Cleanings help to remove plaque deposits called tartar from along the gum line where the bacteria can cause irritation and inflammation, two of the leading causes of gum disease. Our staff can also provide you with help tips on the correct way to brush and floss, and answer any questions you might have about your oral health. Remember, it’s easy to take your oral health for granted until something goes wrong. Stay proactive with your oral hygiene and you’ll be that much closer to enjoying a wonderful smile for a lifetime. Call Barrett Family Dental at 503-690-9667 to schedule your next appointment!